Giovanna D’Arco is Verdi’s seventh opera and is numbered likewise in this series called Tutto Verdi from the Regio Theatre in Palma. The promise is of recordings of all twenty-six of Verdi’s operas, plus the requiem, in celebration of the bicentenary of the composer’s birth. Verdi aficionados will know that there are twenty-eight Verdi titles. My guess is that the ‘missing’ two will be Jérusalem (1847), which was a re-write of his fourth opera, I Lombardi (1843) to a French libretto for the composer’s debut at the Paris Opéra, and Aroldo (1857). The latter was a re-write of Stiffelio (1850) to get away from the portrayal of a married Protestant Minister that offended some audience sensibilities in many parts of staunchly catholic Italy. Giovanna D’Arco was premiered a mere four months after I Due Foscari and six months before Alzira. These were the years that Verdi was later to call his period in the galleys. Not only was he composing but also presenting revivals in various theatres throughout Italy. Whilst his first four operas had been premiered at La Scala, his fifth was first seen in Venice and his sixth in Rome. Both the latter had been successful, helped by the librettos produced by Piave who worked hand in glove with Verdi himself, the composer having an excellent theatrical sense. Although he always felt himself indebted to Merelli, the La Scala impresario who had given him his first opportunities, Verdi had been reluctant to go back to La Scala with a new work. Merelli was a very warm-hearted and generous man, but a pretty lousy impresario. Far too often singers dictated what went on. This even involved them inserting arias, by any composer in order to show off their strengths or to give greater weight to a part that they considered not commensurate with their status. Although little is known of the genesis of Giovanna D’Arco it seems that Verdi, perhaps under pressure from Merelli and his publisher Ricordi, agreed to compose another opera for La Scala in 1845 to make up for the loss of his services the previous year. This was despite the fact that the impresario would have the choice of singers, subject and librettist, as was the standard practice at La Scala. The librettist chosen was Temistocle Solera who had produced the book for both Nabucco and I Lombardi. Solera, aware of copyright problems in France was keen to state that his libretto had no connection with Schiller’s play, although the evidence of the libretto contradicts that. Verdi knew the play, but may have been reluctant to work on the subject as several others had done so already. During the composition, Verdi contracted to mount a revival of I Lombardi for the opening of the carnival season. Problems began to gather. The orchestra was too small, the scenery and costumes were inadequate whilst the singers were inclined to take too many liberties. These were the same singers scheduled to present Giovanna D’Arco. Despite a poor public response to the tenor, Giovanna D’Arco was very well received. Soon the street barrel organs were ringing to the prologue tune of Tu sei bella, the demons’ chorus that haunts Joan (CH.12). As well as the stage and singer problems, Verdi’s relationship with Merelli became further strained when the latter negotiated the sale of the full score without the composer’s knowledge. It was the end of a friendship. Verdi vowed never to set foot in the theatre or speak to Merelli again. A man who carried grudges, Verdi carried out his threat until the revised La Forza del Destino was premiered at La Scala on 27 February 1869. The hatchet buried, La Scala premiered the four-act 1884 version of Don Carlo and Verdi’s two final operatic masterpieces, Otello and Falstaff. 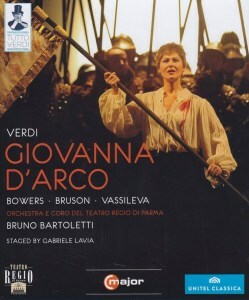 Giovanna D’Arco comes in a lowly twenty-first out of the twenty-six of Verdi’s operas in terms of performances. I can see no particular reason for this. It demands three primo singers, soprano, tenor and baritone as well as a vibrant chorus and only a couple of comprimario. There are no undue complications for imaginative staging, as the work gets here. Yes, the demands on the three soloists are for true early Verdi sized voices; that is not of the weight required for Aida or Il Trovatore for example. Those demands are no more than in other of the composer’s works of this early period in his oeuvre. In this performance from Parma there are distinct weaknesses in the casting, particularly with that of the most famous singer, Renato Bruson, as Giovanna’s father Giacomo. At the time of this performance he was aged seventy-two and it is polite to say that he was vocally past it. As ever with him, his acted interpretation, with apt facial and body involvement is first class. Regrettably, he is unable to hold the vocal line and exhibits an unsteadiness that verges on a wobble allied to dry, raw and rough tone. His vocal problems are evident as early as Giacoma’s prayer (CH. 8) with the whole of the last two acts, in which the role is dominant, barely listenable (CHs.23-36). Despite his milking the tepid applause at the curtain it is hardly a surprise to hear that he cancelled after this premiere to be replaced by Devid Cecconi who, it is reported, saved the performance (see review) with his singing and acted interpretation. Even with an international cast of other renowned Verdi interpreters in the roles of Giovanna and Carlo it would not have been possible mitigate Bruson’s vocal weaknesses. As it was, neither the Bulgarian soprano Svetla Vassileva as Giovanna, nor Evan Bowers as Carlo, is ideal vocally. She certainly has the slight figure du part for the role. Her warm soprano is appealing and she acts with conviction. However, her voice thins above its centre, not ideal for a role that glories in Caballé on the EMI audio recording (CMS 7 63226 2). As Carlo, Evan Bowers has a strong and clearly articulated tenor voice and on occasions attempts to vary his tonal colour in the interests of expressing the emotions he feels towards the saviour of his country. He strains somewhat for top notes (CH.5). The two lesser roles are adequately taken with the Talbot of Maurizio Lo Piccolo being the more notable. The vocal weaknesses are particularly frustrating given the imaginative staging, sets and costumes, the latter in period for The Hundred Years War as the libretto specifies. The large chorus has many changes of costume and armament. Sliding panels facilitate the changes of scene. Particularly effective is the forest scene that is quite magical with its falling leaves and imaginative lighting (CHs.18-19). There is a director’s quirk in that the opening and closing curtain tableau shows a battle with the flag of Italy dominant. This was a period when Verdi and his music, particularly his choruses, were associated with the Risorgimento. On the rostrum the veteran Bruno Bartoletti played down the more vulgar rum-ti-tum music and brought out the elegance in Verdi’s score that Levine certainly misses on the EMI audio set; the orchestra respond to his every nuance. The chorus, as in all the previous seven recordings I have seen of this Parma series, are outstanding in their acted commitment and tonal vibrancy, sheer delight. As well as the audio recording referred to, there are two other DVD versions available. That available from Bologna in 1989 features Bruson, Susan Dunn and Vincenzo La Scola as Carlo. It is conducted with verve and sensitivity by Riccardo Chailly (see review). Also from the San Carlo in Naples there’s Nucci and La Scola (TDK DV-OPIDF) but I have not seen that one.